"15 Wanting to satisfy the crowd, Pilate released Barabbas to them. 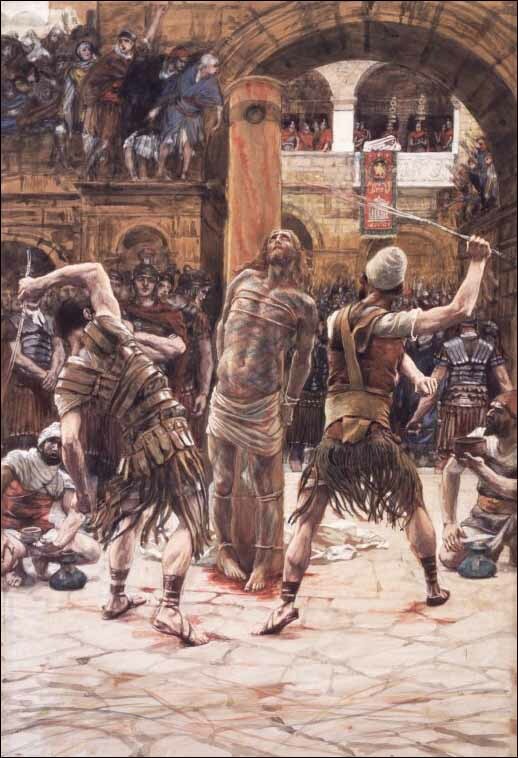 He had Jesus flogged, and handed him over to be crucified. 16 The soldiers led Jesus away into the palace (that is, the Praetorium) and called together the whole company of soldiers. 17 They put a purple robe on him, then twisted together a crown of thorns and set it on him. 18 And they began to call out to him, 'Hail, king of the Jews!' 19 Again and again they struck him on the head with a staff and spit on him. Falling on their knees, they paid homage to him. 20 And when they had mocked him, they took off the purple robe and put his own clothes on him. Then they led him out to crucify him."